Both the Philadelphia Wings and New England Black Wolves had something to prove this weekend. Philadelphia was trying to recover from a fourth quarter meltdown against San Diego the week before. New England was coming off a loss to Vancouver. Both teams were looking to keep their playoff hopes alive. 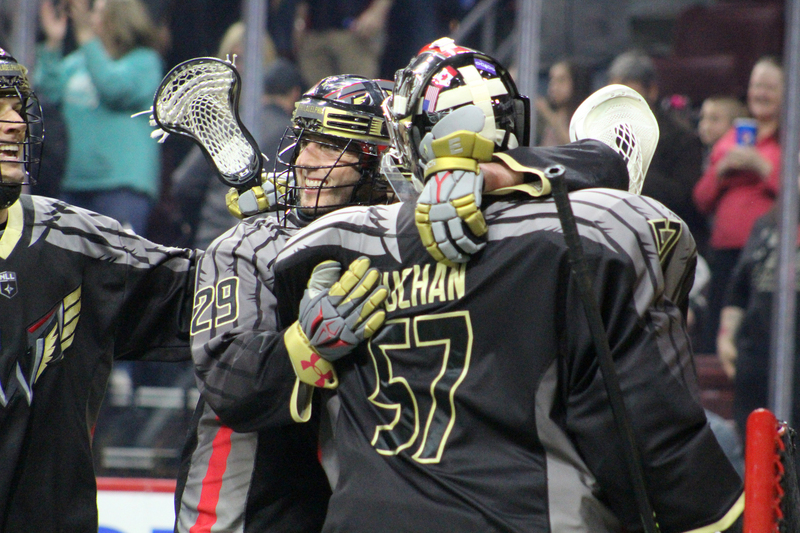 Fortunately, the Wings were able to put together a full 60 minute effort and came out on top 13-9 for their third win of the season, and second over the Black Wolves to give them the season series 2-1. The Wings’ win also prevented the Black Wolves from capturing a playoff spot for another week as they look to make a run in the last month of the season. Philadelphia gave up a quick goal to Tyler Digby just 49 seconds into the game before the Wings found their spark. Blaze Riorden, Josh Currier and Liam Patten all found the back of the net for the Wings before the quarter was over to give Philadelphia a 3-1 lead. The Wings found their offensive surge in the second quarter with two goals from Matt Rambo. Jordan Hall, Kevin Crowley and Vaughn Harris each put in one goal. The Wings seemed to shock the Black Wolves and they never fully recovered. Stephan Leblanc, who is a constant threat to any defense, put two past Doug Buchan in the quarter as he tried to revive New England’s offense. New England came out after the half and seemed to recover, outscoring Philadelphia 3-2. Joe Resetarits scored twice in the quarter, once shorthanded, and Digby added a second goal. Frank Brown and Crowley replied for Philadelphia. The game seemed to grow even more physical setting up for a strong fourth quarter. The fourth quarter has caused a plethora of issues for the Philadelphia Wings this season. The Wings have lost games in overtime and in regulation and given up sizeable leads in those last 15 minutes. 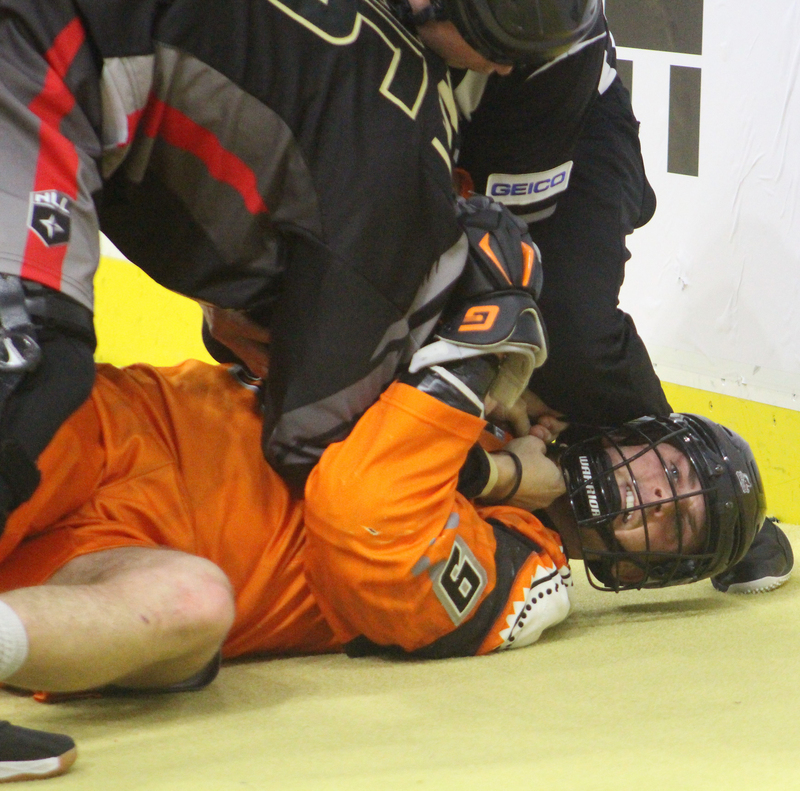 A palpable tension settled over the stadium and it appeared that New England felt confident that the Black Wolves would be able to go howling out of Philadelphia with a victory despite being down 10-6. Such was not the case. Vaughn Harris appeared to whiff on a shot but Josh Currier scooped the loose ball out of the air and whipped it past Doug Jamieson to increase the Wings’ lead to five. Digby replied less than a minute later but the ‘Wolves couldn’t muster much more. With less than five to play, Resetarits found the back of the net for his third, but a power play goal from Crowley put the game away. Anthony Joaquim added a shorthanded empty-netter in the last minute of play. The Wings saw a defense that appeared to be the strongest it has been all season. They flew to the net and supported Buchan the few times the ball came off his stick and could have caused potential goals. They responded to hard hits with control and stronger hits back. They appeared to work as an offensive unit for the entire game versus two or three quarters. Additionally, the Wings were on top in almost every other category. They won more three more faceoffs than the Black Wolves and picked up 58 loose balls to New England’s 52. Buchan had a solid 55 saves. Head coach Paul Day and the players who came in for the press conference were all smiles. They acknowledged how good the victory felt, especially after last week’s heartbreaking loss. Day praised Buchan’s efforts and commented on how rare it is to find a rookie as a starter in the cage in this league. The Wings kept their playoff dreams alive with a win last night. They go to Toronto next weekend to play a Rock team that has dropped four of its last five games. Their last meeting was the most physical game of the season for Philadelphia so they will need to use this time to recover from the scrapes, bruises and cuts they received Saturday night and pull themselves together against one of the toughest teams in the league. New England will also have their hands full next weekend as they go against a revamped Rochester Knighthawks squad.